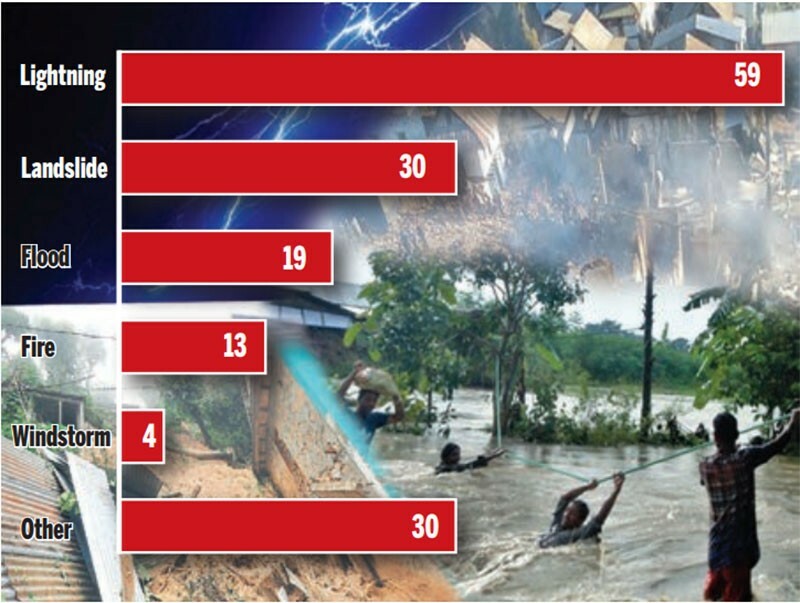 More than 150 people were killed in disaster-related incidents in the last 103 days, according to the latest data of the Ministry of Home Affairs. The data from April 14 to July 25 show 155 people died and 350 were injured in 634 natural disaster-related incidents of lightning, landslide flooding and fire among others, which caused a loss of Rs 1.25 billion. As many as 1,653 families were affected. The highest casualties were reported due to thunderbolt, which claimed 59 deaths and injured 156 people throughout the country. As many as 119 incidents of lightning were recorded during the period. Records show 124 animals were killed in lightning strikes. “Almost every year lighting kills more than 100 people in the country”, said Krishna Hari Acharya, chief of National Emergency Operation Centre under MoHA. After lightning, water-induced disasters like landslides and flooding are major killers. As many as 30 people died in various incidents of landslide between April 14 and July 25 across the country, according to MoHA. Three people are still missing in so far recorded 58 landslide incidents, which completely destroyed as many as 33 houses. Of the 634 incidents of natural disasters recorded during the period, 327 were related to fire. More than 400 houses were gutted in fire incidents, which claimed 13 lives. Fifty-six people were injured. As many as 614 families were affected in fire incidents, which also killed 213 animals. Property worth Rs 1.21 billion was destroyed in various incidents of fire across the country, according to MoHA estimates. In the last three months, floods have taken 19 lives and injured 15 people. More than 100 families were directly affected due to floods that were mostly witnessed along the southern plains. In other disasters in high mountains, six persons died due to high-altitude sickness. One person each died in boat capsize, epidemic and heavy rainfall whereas four others died because of windstorm, according to MoHA. Similarly, 21 deaths have been recorded by MoHA under “other” category.